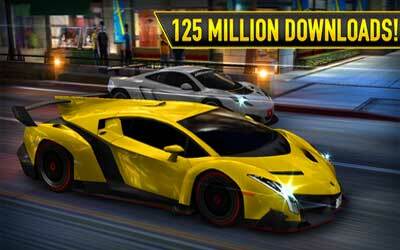 The latest CSR Racing APK has been released and it’s version 4.0.1. This game from NaturalMotionGames Ltd could be one of the exciting and different racing games from the usual. CSR Racing for Android presents a graphical display of interest in which players assume the role as the fastest driver to reach the finish line. You will follow a contest the race in a straight line. You have to achieve the right timing for gear shifting so that power is not reduced and the car can be race faster than the enemy cars that exist. Every time you win a race, you will get the money. This can be used to upgrade the car and items such as engine, turbo, intake, exhaust, nitro, body up to gear box. This game has five playable maps system. Every car you drive can be set to be used in the selected tier. On each tier, you will be given a few games. Regulation is a game where you can set the difficulty level of the game. Then there is Ladder where the level of difficulty and the longer the enemy will increase. In the Daily Battle, you will be loaned a better car so that it can compete with the racing cars that have the same quality. Crew Battle is the most interesting part where you can fight against gang car. To be able to defeat the boss, you have to play the games for 3 times and you need 2 gases for a boss fight. This game is already using 3D graphics. It makes the display better and attractive. Some details such as car racing and shadows depicted in great detail and supported by sound that make this game be seen more lively and more interesting. CSR Racing for Android became one of the exciting game of racing with many challenges contained therein. You can enjoy it by downloading it first in the Google Play Store. Enjoying it on this android tablet. This is the best racing game I’ve played on a portable device!